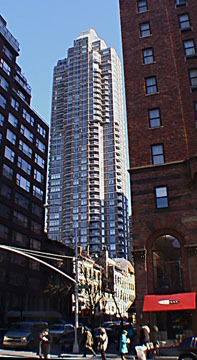 This 40-story, 205-unit condominium tower is one of the anchors of the revitalized Third Avenue that took shape before the stock market crash of 1987. 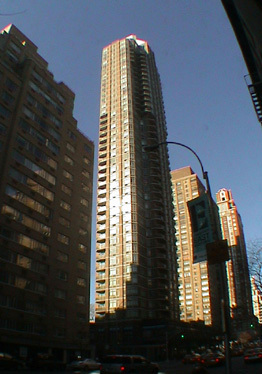 Completed in 1986, this tall, freestanding building reminds one of an asparagus as the top half is more elaborate than the lower half and the crown almost comes to a point. 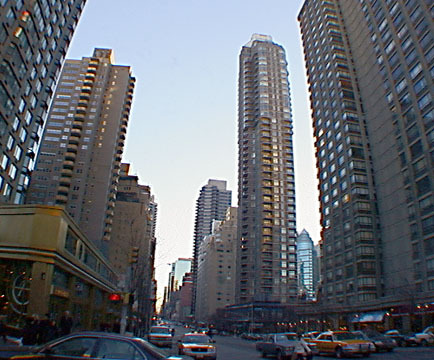 Certainly, this building and a couple of its neighbors sprouted a new skyline for the avenue, which in this period took on a very gentrified "boulevard" air as several of the towers, including this one, were setback from the street, creating a sense of more openness. Developed by Ian Bruce Eichner, Robert Michaelson and Martin Gang, this soaring edifice is quite dramatic. Its substantial plaza, however, is rather quizzical with its rough-cut pink stone, plantless pergola that bears no relation to the tower, nor to just about anything else. 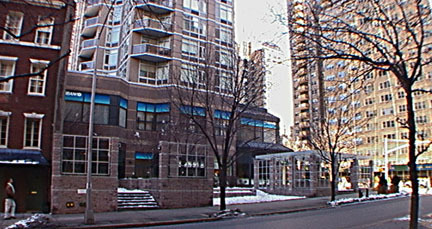 The pergola, in fact, appears to be merely a folly and follies are desperately welcome in New York, especially on the Upper East Side where there are few. Still, this is neither beautiful nor interesting, just puzzling and as such detracts considerably from the project’s overall impact. It is not offensive, as are the spike planters across the avenue a block or two to the south at another building’s plaza. It is just quirky, like the gray granite tempietto not far away in the curved corner plaza of the office building at 135 East 57th Street (see The City Review article). 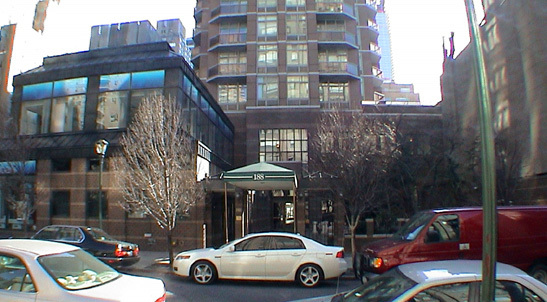 While this building has no sundeck or health club, it has striking vistas from many apartments and a superb location. The building’s massing and proportions are excellent, although the rooftop enclosure is surprisingly industrial and disappointing, not in form, but materials. The design architects were Alfredo De Vido Architects and Schuman, Lichtenstein, Claman & Efron was also involved. Voorsanger & Mills designed the lobby spaces and Quennell-Rothschild Associates was the landscape architect. 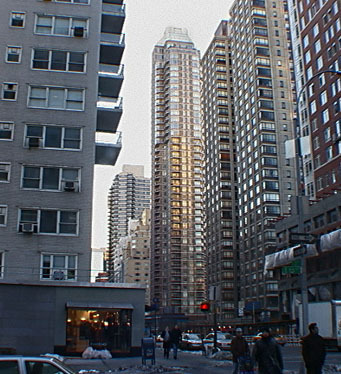 This and Bristol Plaza, one block north and across the avenue (see The City Review article), compliment each other nicely as two, proud, spindly monoliths that are quite similar in proportions, not unlike the shorter and squatter Trump Plaza (see The City Review article) and the Savoy (see The City Review article) on opposite sites of the street and avenue three blocks to the south. These two, unofficial pairings give this section of Third Avenue a lot of tingling resonance. The building's entrance is a bit understated given the eccentricity of the pergola on the other side of the building and the soaring quality of the tower, which has a great many angled balconies that give sharp definition to its form.